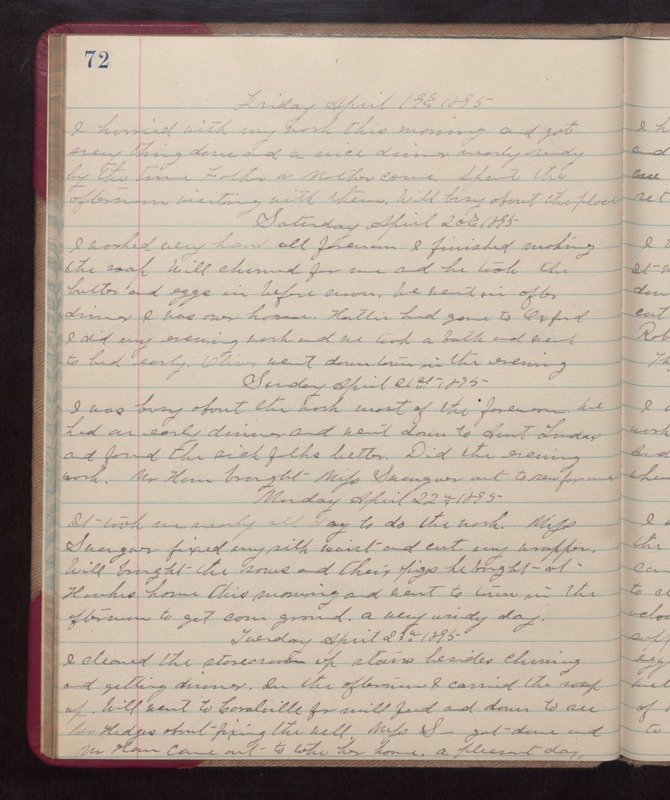 Friday April 19th 1895 I hurried with my work this morning and got many things done and a nice dinner nearly ready by the time Father and Mother came. Spent the afternoon visiting with them. Will busy about the place. Saturday April 20th 1895 I worked very hard all forenoon. I finished making the soap. Will churned for me and he took the butter and eggs in before noon. We went in after dinner. I was over home. Hattie had gone to Oxford. I did my evening work and we took a bath and went to bed early. Olvier went down town in the evening. Sunday April 21st 1895 I was busy about the work most of the forenoon. We had an early dinner and went down to Aunt Ludas and found the sick folks better. Did the evening work. Mr Ham brought Miss Swengar out to sew for me. Monday April 22nd 1896 It took me nearly all day to do the work. Miss Swengar fixed my silk waist and cut my wrapper. Will brought the sows and their pigs he bought at [Hunkis?] home this morning and went to town in the afternoon to get corn ground. A very windy day. Tuesday April 23rd 1895 I cleaned the storeroom up stairs besides churning and getting dinner. In the afternoon I carried the soap up. Will went to Coralville for mill feed and down to see Mr Hedges about fixing the well. Miss S--- got down and Mr Ham came out to take her home. a pleasant day.